Welcome to the Utah Gastroparesis Institute. This clinic and its providers are dedicated to the comprehensive treatment of the gastroparesis patient. Unfortunately, many patients by the time they have found this web site have gone through many physicians, many diagnosis and much pain and suffering. This web site seeks to educate, inform and hopefully provide hope by educating you the patient on the many treatment options for the patient suffering from gastroparesis. Gastroparesis (gastro-, "stomach" + -paresis, "partial paralysis"), also called delayed gastric emptying, is a medical condition consisting of a paresis (partial paralysis) of the stomach, resulting in food remaining in the stomach for an abnormally long time. Normally, the stomach contracts to move food down into the small intestine for additional digestion. The vagus nerve controls these contractions. Gastroparesis may occur when the vagus nerve is damaged and the muscles of the stomach and intestines do not properly function. Food then moves slowly or stops moving through the digestive tract. Doctors must rule out other causes of the symptoms like a bowel obstruction, sphincter of oddi dysfunction, Celiac Sprue, and Irritable Bowel Syndrome. After doctors have determined that nothing else is the cause of the problem, they should perform a gastric emptying test, the most popular of which is a Scintigraphy. Nuclear Scintigraphy usually involves eating an egg meal made with a nuclear isotope. This isotope is followed by the technicians to see how much of the egg meal empties over a four hour period. A percentage is then assigned to the amount that is pushed through the stomach over the four hours. Anything that is less than 90% emptying over four hours is considered positive for gastroparesis. Diabetes is the largest known cause of chronic gastroparesis. It is not entirely known why diabetes can cause gastroparesis, but studies have suggested that a lack of glycemic control plays a part.It is believed that the lack of glycemic control causes nerves in the stomach to die and that once dead the stomach stops functioning. One of the first treatments for diabetic gastroparesis is helping the patient obtain glycemic control. This can be seen after any surgical procedure on the abdomen, often times unrelated to surgery on the stomach. Long term prognosis is unknown for this type of gastroparesis. Spontaneous resolution has been seen in some patients with post-surgicalgastroparesis. A vagotomy is where the surgeon cuts the Vagus nerve, a nerve that connects to the stomach. This is intentionally done to help those with peptic ulcer disease in some cases and is sometimes inadvertently done in other abdominal surgeries. It is not likely for this to cause gastroparesis but it does sometimes because communication between the stomach and the brain is impaired. A nissen fundoplication currently seems to be the leading cause of gastroparesis in postsurgical cases. A nissen fundoplication is done to alleviate reflux but can cause gastroparesis in one of two ways. The first is by cutting some or all of the Vagus nerve (refer to Postvagotomy) and the second is the nissen fundoplication is thought to aggravate underlying stomach dysmotility causing the problem to start. After a single lung transplant around 25% of patients develop gastroparesis while up to 80% can develop it with both a heart and a lung transplant. There are many suspected reasons like vagal nerve dysfunction, infection, and the immunosuppressant. Idiopathic Gastroparesis is gastroparesis that has no identifiable cause. This test works by having the patient eat a radioactive labeled meal. After the meal is eaten the patient sits in front of a nuclear imaging camera which detects the amount of radioactive material in the stomach. This allows the doctor to measure how fast the stomach is emptying. This test is the current gold standard and most accurate test for gastric emptying. However, it is takes a long time to complete, at least 2-4 hours. In this test the patient swallows a small pill that has sensors for temperature, pH, and pressure. This pill collects and transmits data of the test to a receiver the patient wears. The advantage for this test is it does not take 4 hours in the doctor’s office, but the patient does have to make two visits to the office. Also this test measures the motility of the whole GI system instead of just the stomach, and it can diagnose extreme gastric slowing longer than 4 hours. It, however, measures the rate at which the stomach passes indigestible components which happens after food is passed so the results can be different than the scintigraphy. The breath test requires the patient to eat a test meal with non-radioactive isotopes (mainly C-13). The isotope when it reaches the intestines creates gas which is then exhaled and the amount breathed out is measured. This test has shown good correlation to the scintigraphy but is not as accurate because multiple other factors can affect the rate the gas is expelled. However, it is useful as it takes limited training, does not require expensive equipment, and can be performed almost anywhere. This test uses ultrasound technology to asses gastric emptying. The patient can eat a variety of substances depending on who is administering the test. An ultrasound is then taken of the stomach. The tests administer then measures the stomach area and uses this to find gastric emptying over time. This test can be done with either a 2D or 3D ultrasound, but the 2D is more widely used because of accessibility. This test has been shown to be comparable to the scintigraphy and is more easily administered like the breath test. An MRI of the stomach is taken after the patient has eaten a meal. This has not been effectively studied so no right way of doing the test has been determined yet. The MRI is very accurate in measuring stomach volume and emptying. However use of MRI to measure gastric emptying is limited due to the amount of imaging time it takes to measure gastric emptying and the limited time and availability of MRI machines. This test measures the electrical pulses in the stomach that cause contractions. Electrodes are placed on the skin to detect the pulses. If done correctly it can accurately determine if the patient has a problem with their gastric pulses. This is used to diagnose gastric dysrhythmia, however, it doesn’t diagnose gastroparesis. Instead, done in correlation with a gastric emptying test, it can determine the cause of the gastroparesis in some cases. The first treatment for gastroparesis is changing the dietary pattern of the patient.Some changes that can be made to help improve gastric symptoms are smaller meals, increased liquids, softer solids, decreased fat, and less fiber. Basically, we are trying to find foods which are not affected by reduced gastric motility. Your physician and dietician should also be finding foods to help you prevent weight gain which is very common in the early stages of gastroparesis. Because of the nature of the disease, patients with gastroparesis are prone to malnutrition. Gastroparesis often causes the body to not absorb enough iron, calcium, Vitamin D, and Vitamin B12. Your health care provider should do a nutrition assessment in order to find your risk for malnutrition and recommend action from there. Almost all gastroparesis patients should be taking vitamin supplementation. Prokinetic drugs are designed to help treat what is believed to be the underlying cause of gastroparesis, the delayed gastric emptying. There are many kinds of prokinetic drugs; however, they all work by blocking a specific hormone in order to increase gastric motility or cause contractions. Although there has not been significant evidence to show a correlation between the speed of gastric emptying and the severity of side effects,prokinetictreatment hasbeen useful in treating gastroparesis in some people. Antiemetic drugs are a classification of drugs which seek to reduce nausea and vomiting in patients. Antiemetic drug treatment targets the symptoms of gastroparesis instead of the believed underlying cause, delayed gastric emptying, because of the lack of association between delayed gastric emptying and symptoms. Antiemetics are often used in conjunction with prokinetics to relieve nausea and speed gastric emptying. Electrical stimulation therapy like prokinetic treatment attempts to speed gastric emptying. However, instead of blocking hormone receptors in the body, electrical stimulation therapy provides electrical pulses in the gut in order to cause the muscle to contract. 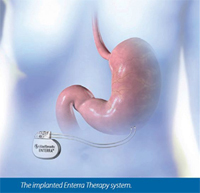 A device is surgically implanted and is supposed to act like a pacemaker for the GI tract. This is a type of electrical stimulation therapy that uses a system of short pulses of electricity from an implanted device. Studies have shown decreases in GI symptoms, hospitalizations, prokinetic usage, and medical costs for those using Enterra therapy. It also shows an increase in nutrition and quality of life in mainly diabetic, idiopathic, postsurgical, and medication related gastroparesis. This is probably due to the remarkable decrease in nausea/vomiting in patients receiving the treatment.One study reported lessoning of nausea/vomiting in 70% of patients. Enterra therapy is thought to work by stimulating the vagus nerve which is responsible for GI control among other things. This type of therapy has not been shown to help with gastric dysrhythmia as the pulses are not as long as the body’s normal gastric pulses. 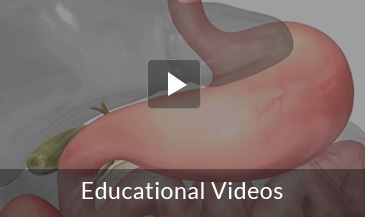 Surgical options for gastroparesis is a laparoscopic subtotal gastrectomy. This option should also be considered as one of the primary surgical treatments for gastroparesis given the significantly higher rate of symptomatic improvement. The laparoscopic subtotal gastrectomy has the benefits of the minimal invasive approach, by removing large parts of the diseased stomach, including the antrum of the stomach, but leaving behind a large enough stomach to have an excellent quality of life. The removal of the diseased stomach helps the improvement of decreased nausea and vomiting after surgery.